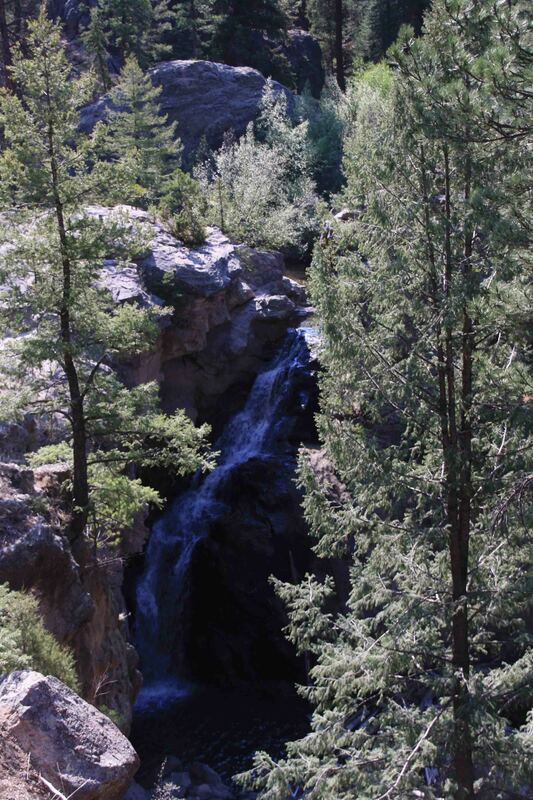 After another night in the forest, I was bound and determined to get to Jemez Falls. The only way I knew how was to walk through the closed campgrounds or go to the East Fork Trailhead. I thought the walk through the campground would be shorter for Petey, so I chose that route which ended up being at least 1.5 miles on a paved road before we got to the short trail. Coming from the East Fork Trailhead probably would have been only slightly longer and much prettier. Oh well, that’s how it goes with limited knowledge of the area. 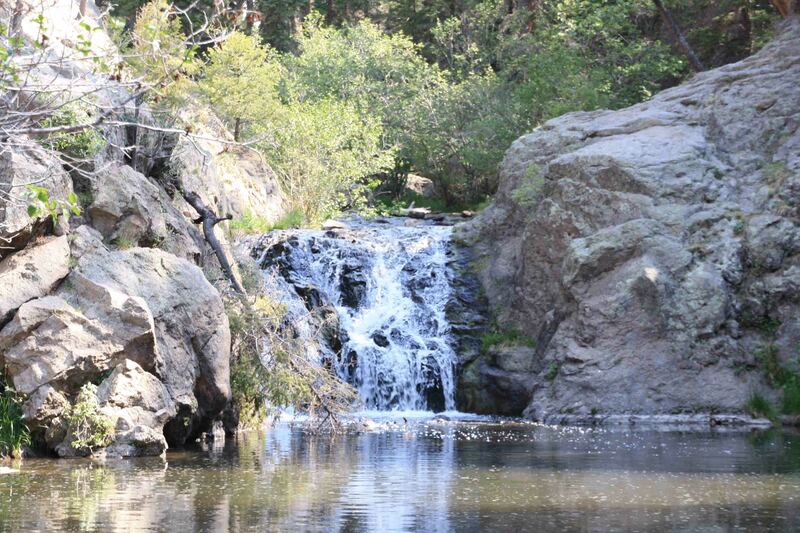 The falls were of the peaceful type as the Jemez River gracefully splashed between jagged rocks. After visiting the falls, we made a short stop at Battleship Rock where I chatted with three young girls working as rangers for the summer educating visitors on the nearby water shed. One of the girls had graduated school while the others were still attending college studying environmental science, Spanish, and adventure activities. The young lady who was attending school in Prescott, Arizona is spending next semester in the Grand Canyon and getting credit for it. Why didn’t I think of that? Have a great time with Buck and Kelly! Tell them hello from your ancient Mom! 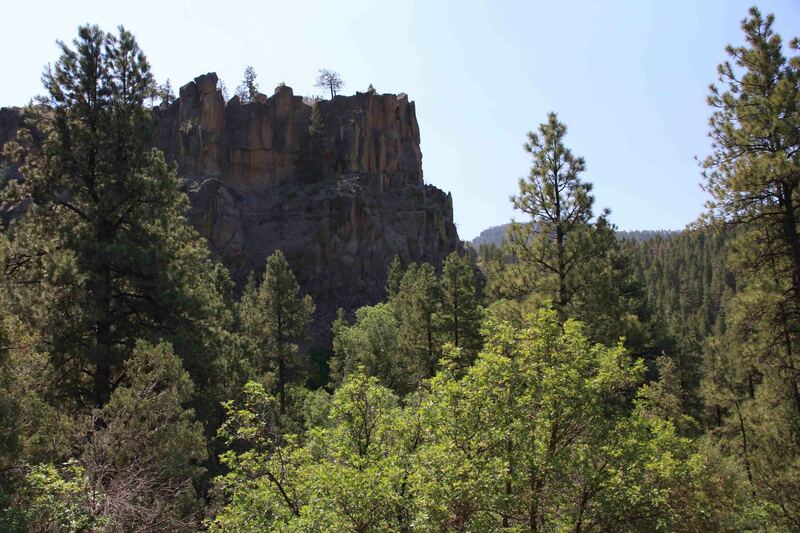 You should checkout some giant gouge located between Taos & Santa Fe. Greg Chastian & I visited some great bridge that goes over it. We were on a skiing trip to Taos when Greg read about it and stopped for a photo op. It was really nice meeting you and hearing about your travels! It seems like you’re on a really exciting adventure, and I hope you and your pooch are having fun! ps. David, I think that gourge your talking about is the one and only Rio Grande! Checked out your blog…it’s great. Enjoy your semester in the Grand Canyon.